I've seen plenty of Zuma imitators emerge since discovering the game back in early 2004. It's still my favorite. The object of Zuma is to eliminate all balls rolling onscreen before they reach the Golden Skull. If you don't eliminate balls fast enough, you lose the round. How do you eliminate balls? When you fire a ball into two or more balls, making a group of 3 or more, they explode! While this sounds simple, the spinning balls have a mesmerizing effect that will leave your head swimming. When you eliminate all the balls on the screen, you advance to the next level. 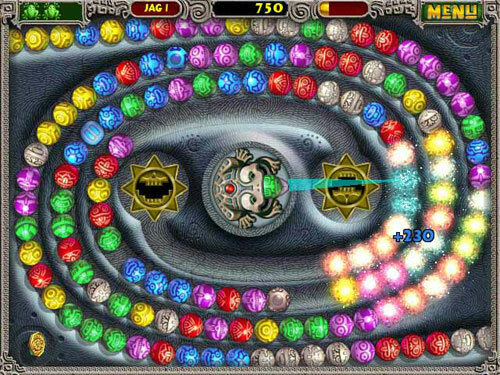 Zuma Deluxe is designed by PopCap, who created one of my favorite puzzle games of all time - Bejeweled. Zuma tests your dexterity while offering some of the best sound I've heard from an arcade style game in ages. Game play is extremely fast paced, although you'll find time slipping away as you play more and more levels. The sixty minute trial goes fast.